Ouch, ouch, ouch! I used to sew a lot for my kids when they were little and I always thought I was going to sew through a finger or a thumb, but never did. oh I love these, the twins will be Turkey stars. I have been known to sew through the fatty bit on my forefinger more than once, and I slipped down the stairs, does this count for turkish behaviour ;-). I could almost feel that as I get cut and stabbed working around here, I know the feeling. It must have been a self sealing wound, I have had that happen rarely. I don't think you were stupid, that would be the case if you had put a couple stitches in. The shirts came out good and the boys will look the holiday. Those are ADORABLE! Next time, buy fusible interfacing and iron your designs to the shirts before you stitch around. No tacky adhesives or pins to deal with and your machine will thank you. The shirts are adorable! What fun the boys will have wearing them! Yikes! I could feel the pain of the needle as a read this post. Oh my gosh... OUCH!! I am still shuddering just thinking about it.. The shirts did turn out cute. I've run a sewing machine needle through my thumb more than once and OW! does it hurt! Latest stupid thing? Um, the pooches ganged up on me as I was walking into the bathroom this morning and between they and the wet floor (someone had been drinking from the toilet methinks) I managed to do a half-splits, backbend combination right before I hit the floor. I have a feeling that movement is going to be very painful for a few days. As a kid I did wonder once what it felt like to staple your own finger...trust me, it hurts too! Yeowwwch! Love the shirt but sorry you had to hurt yourself. When I was teaching sewing to kids one of the little girls put the needle right through her finger even though I was sitting right beside her (and reminding her constantly about the safety zone). Accidents happen so quickly. One moment of distraction and wham! 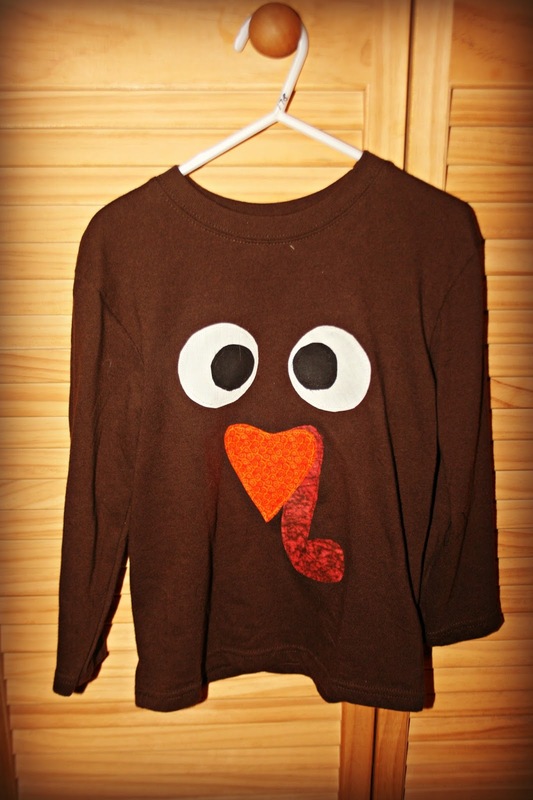 The turkey shirt turned out cute! Interfacing as Cat said is the way to go for sure next time. Oh my goodness my mouth was dropped as I read this and was praying there wouldn't be a picture of it as I scrolled down. Glad it wasn't as bad as it sounded like it would be. Shirts are cute! Yeeeow! That had to hurt big time. If I didn't do something stupid every day, something would be terribly wrong around here. OW! Just imagining that hurts! I remember my mother sewing through her finger one time and it really hurt. The shirts are soooo cute. The boys will be adorable in them. Cute shirt but so sorry about your thumb piercing....ouch! But I love the turkey shirt! That just sounds so unbelievably painful! I've stapled right through my thumb but I think yours trumps that any day. YOW! Eeeek! I'm wincing just thinking about that. I would probably have been in shock! I do stupid stuff daily! Love the turkey t-shirt. Oh, Lisa, my stomach turned over as I read this. I am SO glad it is alright and did not get infected or need a trip to the E.R.!!! It must have hurt like CRAZY!!! The shirt is SO cute!!! You seemed to have handled this very well. Could be a mom thing? Darling shirts! hi my frineds,, I wanted to thank you for the well wishes and love you sent to me. yeouch, that hurt just reading about it. I've seen several chums do the same thing over the years - i think about it each time i plug in my machine . .
And to answer your question: YES---I've done lots of stupid things in my life... Geessshhh. I told and told my kids to be careful when cutting with a knife. I went to cut a plastic tie off a sprinkler and looked at everyone and said I stabbed myself. I had stabbed the top of my hand and was a little squeamish. Ouch! I made turkey shirts for my boys last year with my sister. I have days where I have the dropsies. It just seems like I can't hold anything in the kitchen. One day I dropped one of those gigantic things of spinach leaves. Oh my goodness! In all my years of sewing, I've never sewn through my thumb! On a positive front, you have a fab shirt to show for it!!! I love it! It would go perfect with the turkey hat I made back in the day. Oh my goodness! I know that had to hurt. When I was young I watched my mother run the machine needle threw her thumb. I guess since then I have been very careful. I have come close though. I love the turkey shirt. You poor baby I can't believe it I hope you are okay and no infection. The outfit your made was wonderful.